Phibro Animal Health supplies a range of antibiotics specifically for use with beef cattle. Neo-Terramycin (neomycin/oxytetracycline) – is a broad spectrum cattle antibiotic that contains 2 powerful anti-infectives (neomycin/oxytetracycline). It is ideal for controlling, treating and preventing disease in cattle and calves. The Oxytetracycline element works against a range of infectious diseases caused by susceptible Gram-negative and Gram-positive bacteria including Pasteurella multocida and Mycoplasma synoviae. The other component Neomycin, is highly effective in treating intestinal Gram-negative bacteria, such as Escherichia coli and Salmonella. Terramycin (oxytetracycline) - is another broad-spectrum anti-infective suitable for cattle. It is effective against a wide range of infectious diseases caused by both susceptible Gram-negative and Gram-positive bacteria. The antibiotic is safe and stable and is highly effective in both the gastrointestinal tract and the bloodstream. V-Max (virginiamycin) – is an anti-infective for use in complete feeds for confined cattle. It is highly effective at reducing liver abscesses and can be fed to market with no withdrawal. It also helps to maintain a healthy microbial balance in the rumen, improving both feed efficiency and rate of weight gain. 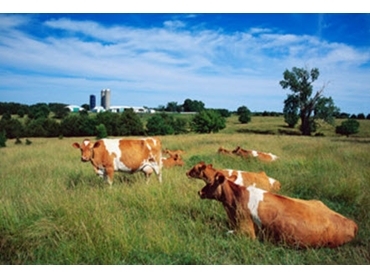 Contact Phibro for more information on its range of antibiotics for beef cattle and other farm animals.